What is it about cakes that can turn us from serious-minded, strong, independent adults to salivating, oogling, impatient eight year olds? Typically, cakes are not regular fare in my kitchen for the simple reason that we would have it for breakfast, lunch and dinner. My fiance is a little more well disciplined than I am; it is easy for him to just say "no." Not the same with me; in a diabetes-free, high cholesterol-free world, cake would be my meal of choice. When it comes to dessert, I lose all sense of decorum. Cooking is my avenue of expression, a beautiful kitchen always catches my attention, I have an addiction to shopping for kitchen appliances, but putting together a beautiful cake takes the cake for me, pun intended. Suffice it to say, the ability to create a a breathtaking, delicious, double layered cake that is actually healthier than a similar looking cake at your neighborhood bakery is the icing on my cake, pun intended again. Healthier because no butter, only a quarter cup of oil and two egg yolks constituted the bulk of its fat content. The secret to obtaining the moistness and lightness in my recipe was brewed coffee and fluffy clouds of egg whites. 1. Set oven to 325 degrees F. Spray two 9" cakes pans with cooking spray and flour well. 2. Sift together cocoa powder, flour, baking powder and baking soda. Set aside. 3. In a standing mixer, beat egg whites. Once soft peaks have formed, add cream of tartar and continue beating until stiff peaks form. 4. Meanwhile, in a double boiler melt chocolate chips. Add cream as soon as the chocolate begins to melt and mix until chocolate and cream are totally combined. Remove bowl from heat and add sugar. Mix until combined. 5. To sugar chocolate mixture, add coffee, vanilla extract and canola oil. Mix well. 6. By this point, the chocolate mixture should have cooled enough to add the egg yolks without scrambling them. Add yolks and combine well. 7. Add flour mixture to chocolate mixture in two installments. Make sure flour is totally absorbed. 8. Mix in 1/3 of egg whites to flour and chocolate mixture, stirring until no white streaks are visible. 9. Fold in second third of egg whites, again until no white streaks are visible. Finally, fold in last third, this time being careful not to deflate the batter. 10. Pour into prepared cake pans and bake for 25 minutes or until a toothpick comes out clean. 11. Remove cakes from oven and set pans on wire rack for 5 minutes. Invert cakes unto the wire racks ad allow to cool completely before assembling. Puree berries, then fold in whipped topping. Set in refrigerator until ready to assemble cake. 1. Place one cake layer in the middle of a cake stand. 2. Spread berry filling unto bottom cake layer, making sure that it does not run down the sides. 3. Place second cake unto first. Pour all of the frosting unto the top of the cake. Working with a thin slanted spatula, spread frosting over the top and down the sides. 4. 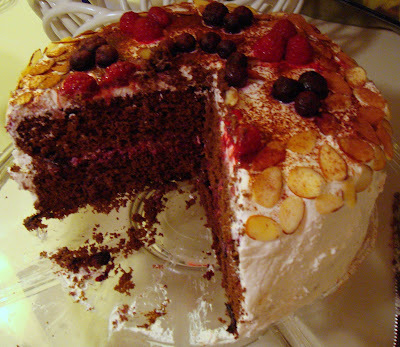 Decorate with fresh berries and sliced almonds if available. Sprinkle with cocoa powder. wow the cake looks amazing!!! yep I'll definitely eat it for breakfast, lunch and dinner too!